Translation: Praise the Lord all nations. Alleluia! de Taizé. Reprinted under OneLicense.net # A-720542. Words: Isaac Watts (1673-1748); ref. Robert Lowry (1826-1899), P.D. how to walk in your path. 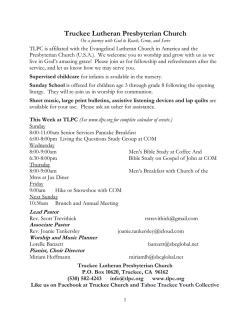 Children through grade five are invited forward to meet with a pastor. NEW TESTAMENT READING II Corinthians 5:11-6:2 This is the Word of the Lord. Please sign the Friendship Pad and pass it to others sitting nearby. wafers are located in the center cup on each wafer tray. art full of truth and grace. e - ter - ni - ty. Words: Charles Wesley (1707-178), P.D. Reprinted under OneLicense.net # A-720542. citizens of the commonwealth of heaven. Amen. Lord, our end -less bless - ing. Words and Music: Joachim Schwarz, 1962, © Mechtild Schwarz-Verlag, Ditzingen, trans. Martin Tel, based on Psalm 121:8. * Please stand in body or spirit. 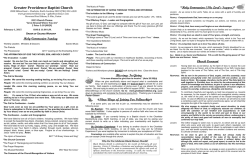 Those parts of the service of worship in which the congregation participates in word or song are noted in bold type. Hearing-assistance devices and large-print bulletins are available from the ushers. Hodgson (captain), Beth Meda, and Peggy Hodgson at 11:00 a.m.
nonprofit agencies, initiatives for social justice, mission agencies, and the emerging ministries of the church in the twenty-first century. 7:00 p.m. service this evening. Food Gatherers of Ann Arbor. peanut-free purchased snacks are available for children. 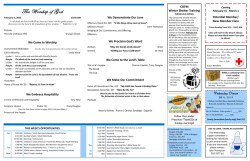 Vacation Bible School and do construction projects. entrances to the Sanctuary for children attending worship at 11:00 a.m. Youth Choir meets at 4:30 p.m. in the Choir Room. or be picked up after half time. March 1. See RJ for all the information. presenter is Rev. Ed Koster. Spirituality: Mysticism.” Presenters are class members. preparation for the February 14 performance of Elijah at Hill Auditorium. musicologist from UM, will give a special presentation on this music. dialogue. 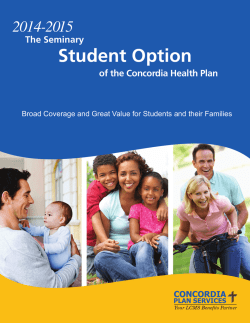 To join this book study, contact Rev. Riegel. Olive Garden, 445 E. Eisenhower Parkway. All are welcome! February 12, for an engaging presentation by Dr. Anne Curzan, Arthur F.
hot lunch prepared by Chef Christine. 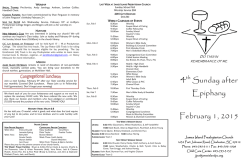 Contact the Church Office to register. baptism. To register for a class, contact the Church Office. 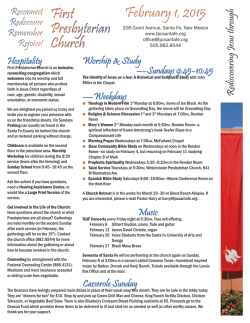 today online at the church website or by contacting the Church Office. “Tell Me More About This Church!” Is this something you might say? for either or both events through Rev. Rogers or in the Church Office. attend. This event is sponsored by the Stephen Ministry Program. and area musicians at these events. 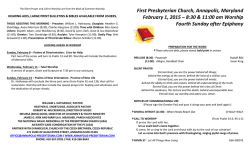 Chancel Choir Rehearsal Thursday, February 5, 7:00 p.m. The Chancel Choir rehearses music composed by Alice Parker. Friday, February 6, 11:00 a.m.
Community SING Friday, February 6, 7:00 p.m.
Unaccompanied audience singing led by Alice Parker. Saturday, February 7, 10:00 a.m.
Alice Parker conducts an open rehearsal for church and choral musicians. 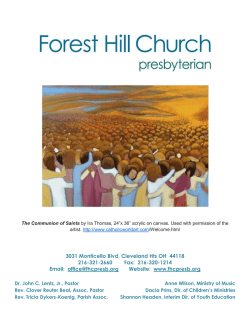 “Singing the Faith” Sunday, February 8, 9:30 a.m.
Worship with unaccompanied congregational singing led by Alice Parker. Theological Seminary, as our guest preacher at the 9:30 and 11:00 a.m.
serves as professor of pastoral ministry. America denominations, Lift Up Your Hearts (Faith Alive, 2013).